This recipe was given to me by a Taiwanese colleague (hey Cindy!) when I asked what I should cook for a Chinese New Year gathering. It's her mum's version of Dong Po Rou, a braised pork belly, which is a dish that's typically served around Chinese New Year, although it's so good that I'll be eating it much more frequently than once a year. It's low maintenance food that, like all good dishes, relies on good quality ingredients. There's very little in the way of preparation and if you cook a fair amount of Chinese food, you're likely to have most of the cupboard ingredients on hand. I'd suggest trying to find Taiwanese rice wine instead of the Chinese Shao-Hsing which I think has a stronger taste that might overpower the dish. The Taiwanese wine is clear instead of the amber colour in most Chinese versions. I've also given a recipe for using up any leftovers, but these sliders are so good that you'll probably want to make the pork just for these incredibly moreish little mouthfuls. It was a happy accident really - I went to the Chinese supermarket thinking I'd recreate the Momofuko pork bao but I could only find small mantau buns in the freezer, so went with that. Actually, I think the buns work best in small mouthfuls since the ratio of pork and other ingredients to bun is better. Whichever way you choose to use the pork you're really going to love this. Serve with steamed rice and your favourite Chinese green. 1. 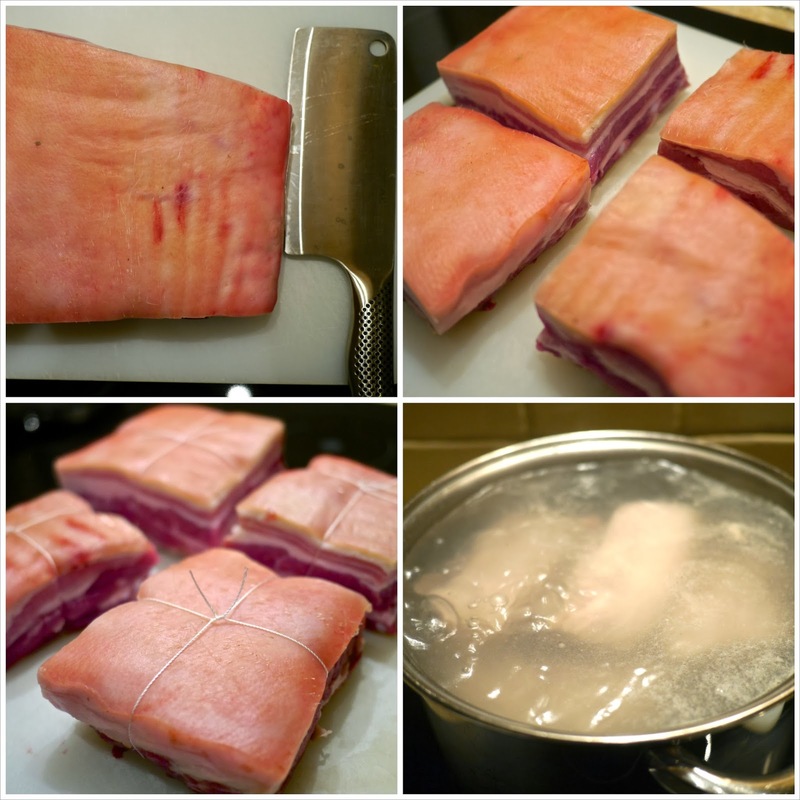 Cut your pork belly into squares of 4x4 or 5x5 inches. 2. Tie the pieces with cooking string. 3. Bring a large saucepan of water to the boil and drop in the tied pork. Boil for 5 minutes. 4. Drain the pork pieces and run under cold water. Pat dry. Brush the pork pieces with soy sauce paste. 5. In a deep Le Creuset-style pan, heat the oil and gently fry the ginger, spring onion, star anise and Chinese cinnamon. Once it becomes fragrant, add the rice wine and 200ml of the water then sit the pork pieces on top. 6. 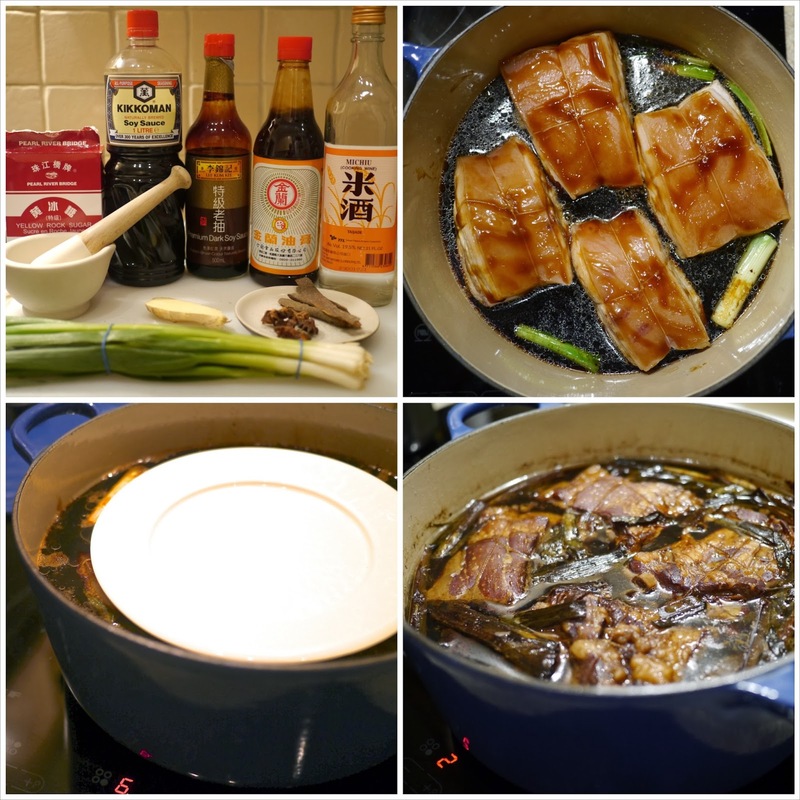 Mix the soy sauces together and pour into the saucepan. Now turn up the heat to a boil. 7. Once it reaches a boil, cover, turn the heat to low and simmer for 20 minutes. 8. After 20 minutes, uncover and add the remaining 600ml of water and sprinkle in the Yellow Rock Sugar. The point here is to ensure the pork is covered by the liquid so you may need more or less water depending on the size of your pan. The pork has a tendency to float too, so put a small plate on top to keep it submerged. Cover and simmer over a very gentle heat for 2.5 hours. You may need to turn the heat up a little at first to get the simmer going again, but ultimately you just want gentle bubbles to caress the pork. Try not to lift the lid too much, particularly for the first 45 minutes. You may want to turn the pork after an hour so that the skin side is down which will help with the burnished, lacquered effect on the skin. 9. After the 2.5 hour simmer, check the pork. A chopstick should easily slide right through the meat and the skin should feel sticky and gelatinous. 10. Remove the meat and keep it in a warm place. Now it's time to reduce the sauce, so turn up the heat and boil. You could also take out a few ladles of the stock and place in a small saucepan and reduce. It'll be faster than boiling all of your liquid. The trick here is to keep tasting the sauce as it boils because you want it slightly reduced but not too salty. Really it's a personal taste thing, but I think that the fatty pork can handle a slightly saltier sauce than you might think. 11. Now it's time to serve. Traditionally, the string on the pork is cut at the table with some shears with the pork hacked into more bite-size pieces so that everyone can dig in. It can be easier though, to slice the pork into thickish slabs that you can easily pick up with chopsticks. Whichever way you choose to present the pork, drizzle over some of the reduced sauce, coating the skin. Sprinkle with some chopped spring onions and serve with a bowl of rice and a Chinese green like stir fried pak choy. Something fresh and green really helps to cut through the richness of the pork. Whatever you do, keep some pork slices for the following recipe. Also, the leftover master stock is great stirred through some noodles, or used to braise something like chicken wings. Sriracha - as much as you like. 1. To prepare the buns, follow the instructions on the packet, which will usually say to steam from frozen for about 10 minutes. So place a metal trivet in a large saucepan and add some water up to about 1cm from the top of the trivet. Place a small plate on the trivet, cover the pan and bring to a boil. When it's boiling, place your frozen buns on the plate. Partially cover the pan and steam for 10 minutes until they are soft and pillowy. 2. While that's happening, crush your peanuts. Place the nuts in a mortar and grind them to a coarse powder. Don't worry about removing the skins as they'll grind in to the powder nicely too. 3. Heat a little oil in a small saucepan until hot and fry the radish or mustard greens until coloured then set aside. 5. Now assemble. Really it's up to you how you put it together, but you could try the following: Cut the buns in half (but not all the way through) and squirt as much sriracha on the bottom hinge as you like. Sprinkle with crushed peanuts and lay some coriander on there too. Lay on a slice of warm pork and drizzle some of the reduced sauce over the pork and the top hinge of the bun. Another squirt of sriracha wouldn't go astray, but that's up to you (I like it hot!). Finally a few strips of salted radish or mustard greens to complete the perfect bite. Close up the bun and enjoy.